Rob shapes and leads Arts Connect’s programme of work. Reporting to Arts Connect’s board and funders, he is responsible for the overall effectiveness and impact of the organisation. Rob builds connections across the arts and education sectors in the region and acts as an advocate for cultural education for children and young people. He ensures that Arts Connect’s work makes a genuine difference for young people, provoking change and improvement to arts provision. Rob’s career started at The Play House, a drama and theatre company for young people based in Birmingham, where he rose to Executive Director. He was Director of Creative Partnerships in Birmingham from 2004 to 2008, leaving to undertake a Clore Fellowship where he was Learning Fellow. 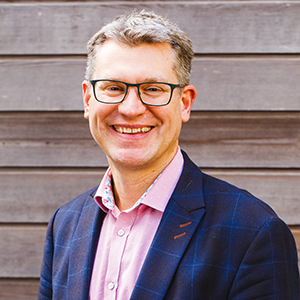 Before joining Arts Connect he was Head of Education Partnerships at the Royal Shakespeare Company, responsible for leading meaningful partnership programmes with schools, theatres and universities across the country and beyond. He is also a Director of the Victoria Park Academy Trust, a Trustee of the Children’s University and Chair of Stan’s Cafe. Rob’s motivation throughout his career has been a strong belief in every child’s right to the arts and the opportunities it gives children and young people to create and learn, to understand themselves and the world they live in and simply to enjoy themselves. Outside the office, Rob tries to see as many exhibitions and performances as he can. He can often be found chauffeuring his family to netball, ballet and cheerleading practice but he does try to make time for a spot of home renovation.